Homemade Copper Cleaner - Can Vinegar Clean Copper? Homemade copper cleaner is easy to make, and its main ingredient is vinegar, a mild acid. Of course, lemon juice also works well to clean copper because it is also mildly acidic. Because ketchup contains a large amount of vinegar you see a lot of recommendations out there to clean copper with ketchup. Ketchup works well enough to clean copper, if you want. 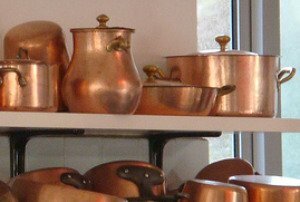 However, I don't recommend using ketchup for your homemade copper cleaner because ketchup also has a tendency to stain other things it touches, and thus, in my opinion, is better left to put on food than for purposes of cleaning your copper. If you do end up using ketchup to clean your copper and accidentally, in the process, stain your clothes, upholstery or carpet, this article about ketchup stain removal can help you remove those stains. Since I don't recommend using ketchup for cleaning copper, what should I use to make a home made copper cleaner you ask? Below are two recipes for cleaning copper with natural products. The great thing about both of these recipes is that since they do use natural ingredients they are also safe to use for cleaning your copper pots, which you don't want to use toxic or unsafe chemicals on and then cook food in them for your family. Step 1. Mix equal parts salt, white flour, and white vinegar to form a paste. Hint: You can substitute lemon juice for the vinegar if you wish, and some people prefer this because of the more pleasant smell. Step 2. Rub the paste onto the oxidized or tarnished copper. Step 3. Wait approximately 30 minutes and then rinse off the paste carefully. Hint: Salt can be corrosive if left too long, so make sure you remove the paste promptly after giving it time to work. Step 4. Dry the copper with a soft cloth, and then buff to bring out its shine. Another way to clean your copper with a natural copper cleaner is to use a sliced lemon and salt. To do this, dip a half a lemon in salt, and rub it on the copper. The salt acts as a mild abrasive while the slightly acidic lemon juice will also help clean the copper, and then rinse well. Hint: Copper is a rather soft metal so be careful when rubbing not to rub too hard and scratch the surface.